When an aquarium hobbyist says "African cichlids" it is understood they mean the cichlids from the African Great Lakes of the Rift Valley in Eastern Africa. In fact, these lakes hold more cichlids than the rest of Africa -- and more than any other region or continent of the world. Most African cichlids prefer hiding places to spawn or reduce aggression. You have a wide variety of options for giving your cichlids hiding places. The archetypal African cichlid decoration is rockwork. Most African cichlids hail from the rocky floor and coasts of the lakes, so using lots of rock helps to simulate their natural environment. You can use rockwork to construct caves and crevices for cichlids to hide and spawn in. Since African cichlids prefer hard water with a high pH, you can use rocks rich in calcium, like tufa rock, limestone and coral skeletons, which slowly leach calcium and bicarbonates into the water, making it more like their preferred water. The African Great Lakes include a variety of fish habitats, including sandy bottoms. Cichlids that dwell in these expanses of sand prefer sandy areas in the aquarium. Such cichlids will usually dig a burrow to hide and spawn in. You can pick from a number of sands, including coral sand -- which ups the pH level -- to chemically inert sands like playground sand from the hardware store. If you want an "authentic" look, most of the sands of the African Great Lakes is tan in color. Some small African cichlids, like Altolamprologus compressiceps, hide in snail shells in the wild. In its home Lake Tanganyika, this species usually hides and spawns in the old shells of the Neothauma snail. 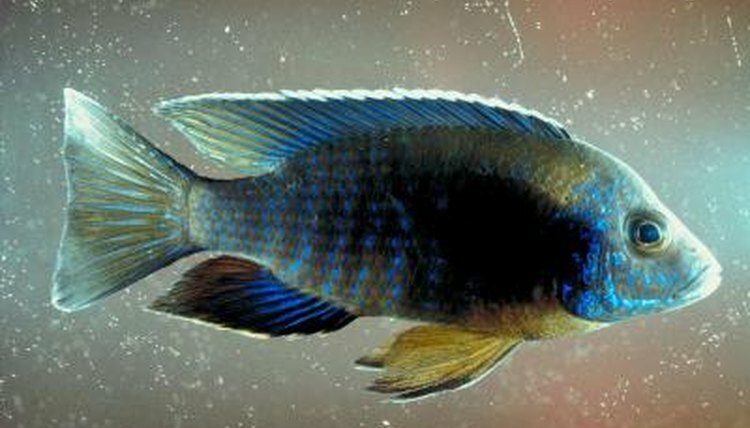 However, in a home aquarium, this cichlid will accept any large old abandoned snail shell for shelter and spawning, regardless of the species. Snail-dwelling African cichlids will also happily use rockwork or flowerpots as a readily acceptable substitute for their beloved snail shells. Terracotta flowerpots make good caves for your cichlids. While the aesthetics can be debated -- some hobbyists like the look, while others consider it unnatural-looking -- cichlids love flowerpot hiding places. You can use these flowerpots in a number of ways, either just laying the pot on its side, carefully breaking it to create openings or halving it to create two caves. Take care when selecting your flowerpots. Old ones from around the house may have absorbed pesticides and fertilizers that can harm cichlids. And new ones from the local home goods store may have come pre-impregnated with antifungals and other chemicals, so make sure you just have clean, plain terracotta pots.